Director says the boys were paid "way over and above what you could pay"
LOS ANGELES, California (CNN) -- The two youngest stars in "Slumdog Millionaire" will get "a substantial sum of money" that would "change their lives for the better" when they turn 18, but only if they stay in school, director Danny Boyle told CNN. 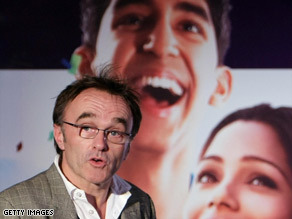 Director Danny Boyle says the youngest actors in his film will get "substantial" money if they stay in school. Rubina Ali and Azharuddin Ismail, both 8, have been temporarily forced to stay away from school by the crush of journalists who have converged on the campus in Mumbai, Boyle said. "The press attention that's been focused on them is really sad at the moment and they've had to leave school temporarily because the press outside the school is disrupting the school," Boyle said. "So, we've withdrawn them from the school for a short while." Boyle, in a CNN interview Thursday, said the boys were paid "way over and above what you could pay," despite media reports to the contrary. The success of the moderately budgeted film, about an orphan seeking fame and love through the "Millionaire" game show, drew a spotlight to the slums of Mumbai, India, where it was filmed. A controversy erupted this week when the children's parents told reporters they felt they were exploited and underpaid for their work. The Telegraph newspaper of London reported the children and their families still live in the same "tangle of makeshift shacks" in Mumbai where they lived when the casting director found them. Azharuddin's situation has gotten worse, the paper said, because "his family's illegal hut was demolished by the local authorities and he now sleeps under a sheet of plastic tarpaulin with his father, who suffers from tuberculosis." This public relations challenge began just as Oscar ballots were mailed to members of the Academy of Motion Picture Arts and Sciences. "Slumdog Millionaire" is nominated for 10 Oscars, including best picture and best director for Boyle. Boyle defended how his production company has treated the boys. "We thought long and hard about how best can we benefit them and we decided to put in place an education plan for them," Boyle said. "We put them in school, a very good school, which they're paid for to stay in until they're 18." "If they stay in school until they're 18, a substantial sum of money is released to them then, which will effectively change their lives for the better," Boyle said. The Telegraph quoted their parents saying Azharuddin was paid less than $2,500, and that Rubina got about $700. "Some of the figures that have been quoted have been very inaccurate," Boyle said. He said he would not quote the real numbers "because to do so makes them vulnerable within their own community. There are people who would take advantage of them immediately." Even the trust fund is a target of "gangsters," he said. "The money that would be released to them when they are older, that is the kind of thing that can be mortgaged off by gangsters," he said. Boyle said the film's financial backers have agreed that charitable groups that help children of the slums will also see "a slice of the profits." "We've all agreed that we will sit down and dedicate a slice of the profits of the film to be distributed amongst people like those who run the school and other organizations who make a big difference to children's lives there," he said. "We gained from the city, both from these two children and from the city, in general, and we'll make sure the film gives back some of the enormous success it's had," he said. -- CNN's Kareen Wynter contributed to this report.